Deas and I had a wedding to attend the first weekend in April on Jekyll Island, and that fit well into our plans to travel up the east coast. 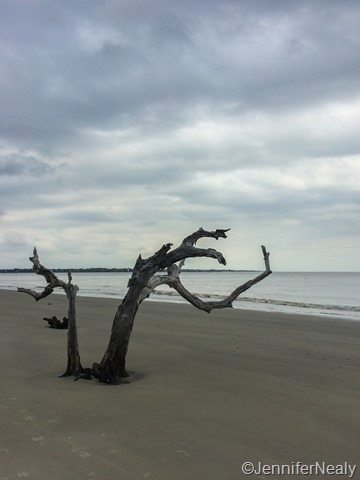 I booked an 11-night stay at the Jekyll Island Campground, and we arrived the Thursday before the wedding. 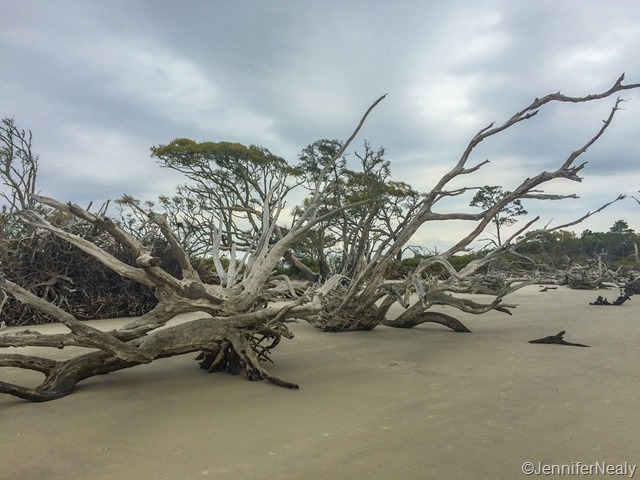 I had never been to Jekyll before, and it is simply gorgeous! 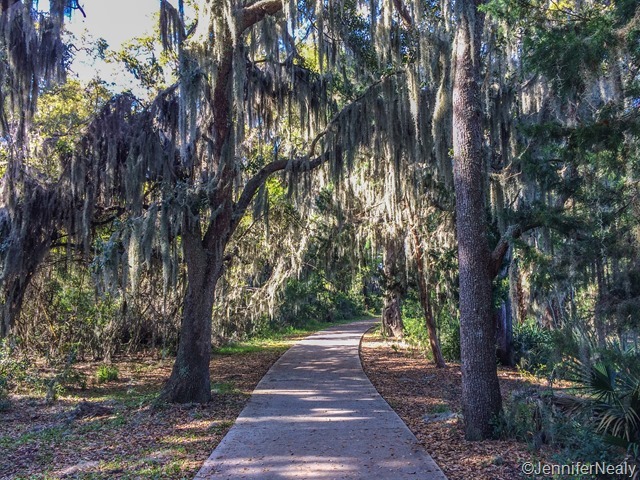 There are spanish moss-covered live oak trees every where you look. There’s a long bike path that runs around the entire island, and it was a great place to walk the dogs. The weather was gorgeous, the birds were singing, and we were so excited to have an extended stay here. The campground itself is also full of beautiful trees, but the sites are a little close together. We had an exterior, pull-through site, and we had plenty of room for our slides and our canopy. Some of the pull through sites face towards the exterior, and those would be nice for giving you a little extra privacy from your front windshield (assuming you’re in a motorhome.) Overall we really liked the campground. Even though the sites were tight, it was very, very quiet. Sometimes I’d walk outside and I couldn’t even believe how many people were there given the silence that was always present! 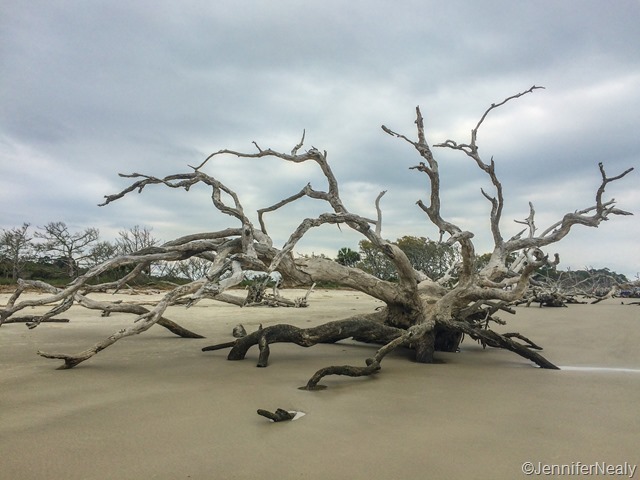 On the north end of the island there’s a beach called Driftwood Beach. The land mass of the island used to extend a little further north than it does now, but it was washed back during a storm. 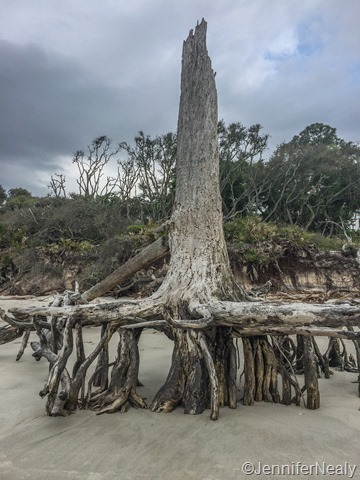 There were live oaks on this part of the island too, but when the storm pushed the land back, the tree roots and trunks remained, creating a beautiful landscape. I only had my iPhone with me when we visited this beach, but I made a mental note to return with my big camera in a few days. Unfortunately that never happened, but more on that later. The wedding we were there to attend was on Saturday night, and it was a gorgeous setting! They were married at Crane Cottage, one of the many historic homes on the island. There was a little rain earlier in the day, but it stopped a couple hours before the wedding, and everything was beautiful. 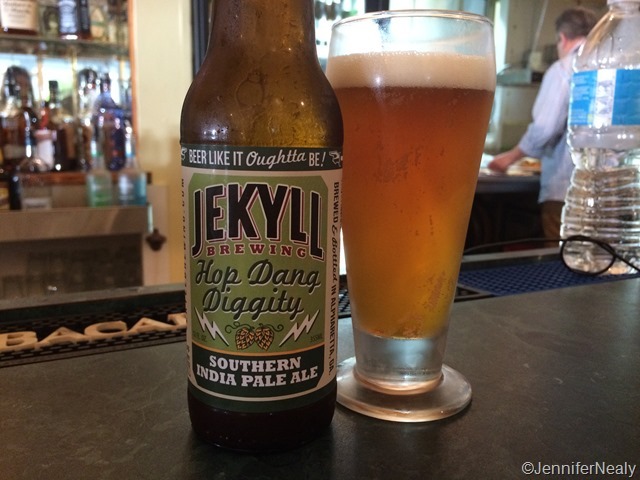 A little shameless family self-promotion time now: My brother-in-law is a minority owner in craft beer company based in Alpharetta, GA called Jekyll Brewing – named after Jekyll Island. So while were on Jekyll, we of course had to enjoy a little Jekyll beer! It’s only distributed in Georgia at the moment, but hopefully will be expanding to other states soon. Deas says it’s one of the best IPAs he’s ever had! I had so many things I was planning on doing during our stay on Jekyll. 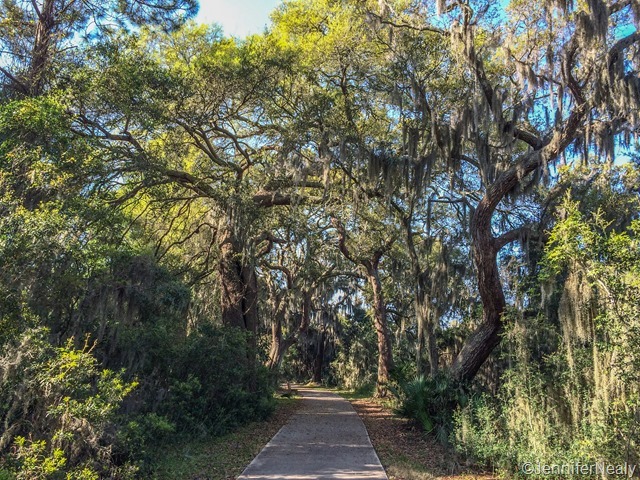 In addition to returning to Driftwood Beach, we wanted to visit the Georgia Sea Turtle Center, I wanted to photograph some of the historic homes, and we wanted to ride the bike path. Alas, sometimes life throws you a curve ball. 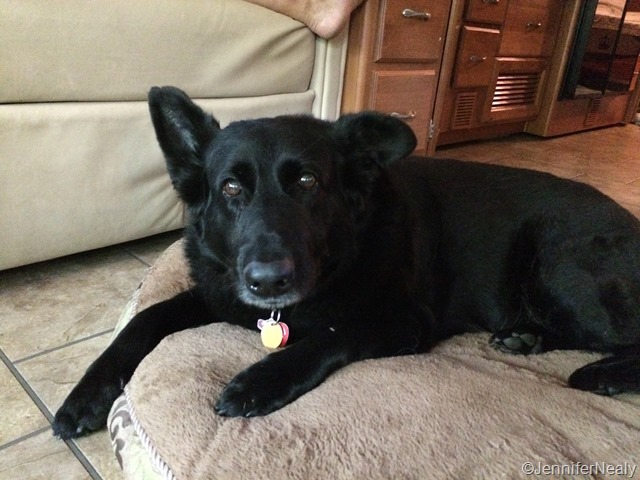 Our dog Nikki had thrown up her food on Sunday afternoon, but given her history of food allergies and sensitive stomach issues, I wasn’t too concerned. However by Tuesday Monday it was apparent something was wrong. So I took her to the vet first thing that morning. When I got her to the vet, we realized she had a fever of 105.5, which is disconcertingly high. The vet recommended I leave here there so they could start her on fluids, and said she would run a blood test to see what was wrong. She called me an hour or so later with a diagnosis of pancreatitis, and said that Nikki should be fine after 24 hours of fluids. I breathed a sigh of relief! 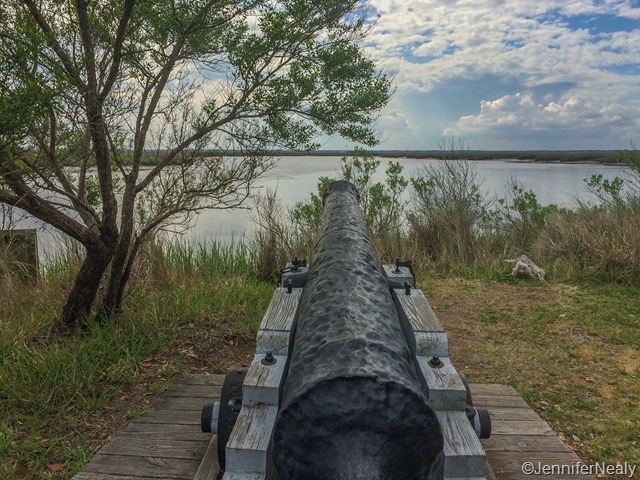 Since Deas and I had a few hours to kill before we could pick her up, we visited Fort Frederica National Monument on nearby St Simons Island. 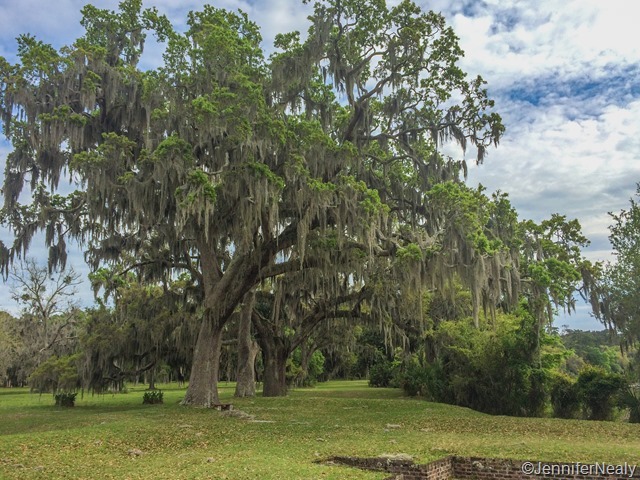 Even more beautiful live oak trees were among the ruins of the fort. When we went to pick Nikki up, the vet told me that Nikki’s fever hadn’t gone down as much as she would have liked. She gave me the option of bringing Nikki home for the night and returning in the morning, or bringing her to the overnight pet hospital/emergency clinic. Of course I wanted to bring her home, but the minute I saw her I knew that wasn’t a good idea. She was still very lethargic, so we brought her straight to Brunswick Pet ER. The vet there, Dr. Kathryn Strickland, is my new hero. She took one look at Nikki’s blood work and told me it was not pancreatitis – she was certain it was something more serious, and urged me to book an emergency appointment for Nikki for a specialist ultrasound in Jacksonville, FL early the next day. At first I resisted – I said I would book an appointment if Nikki wasn’t better in the morning. But she was very insistent, so I listened to her. I asked her to make the appointment, and we got Nikki settled in to spend the night with her. 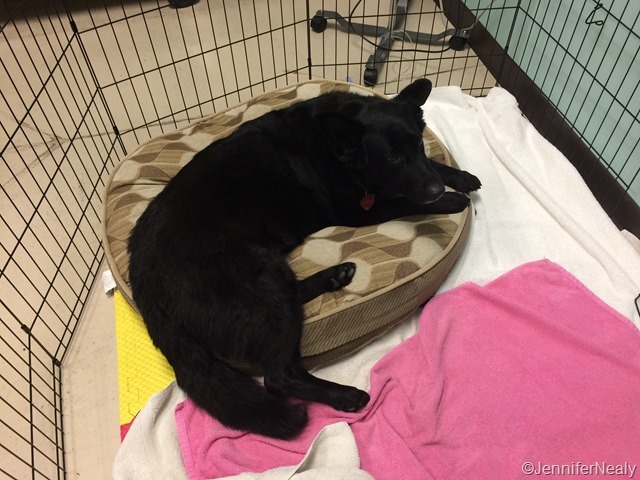 This is Nikki as we left her that night – it was so hard to see her feeling so badly. That night I also emailed our regular vet, and gave him all of the info. He responded early the next morning, and said that he agreed with Dr Strickland, and since I trust him completely, I went and picked Nikki up and drove her to Jacksonville. Dr Strickland referred us to Dr Katrina Toshach at SEVO-Med in Jacksonville. She performed an ultrasound, and after studying it, told me that Nikki had a gall bladder mucocele, and would need emergency surgery the next morning. Needless to say I was very upset, and all of the staff at SEVO were so compassionate and kind to me. I called Deas and he decided to pack up the RV himself and drive it down to Jacksonville so we could be closer to Nikki. So I said another tearful good-bye to Nikki, and then met Deas at the RV park we had chosen for the night. Overnight Nikki was transferred to the care of surgeon that would perform the surgery – Dr Carlos Aragon at Affiliated Veterinary Specialists. He is my other new hero. I met with him early that morning and he very thoroughly explained everything to me. I was able to spend a couple of hours with Nikki before they needed to sedate her, and I waited there at the clinic while she was in surgery. It was a very long 90 minutes, but soon enough Dr Aragon came back into the room with a big smile on his face. It was all I could do not to hug and kiss him! He is an amazing vet, and I am so very grateful Nikki ended up in his care. The next day I visited Nikki, and she was still a little out of it and had a horrible new hair cut, but I was so relieved knowing she was on the mend. Nikki spent two nights at the hospital, and she came back home on Saturday. She is still very sore, but she is eating well and resting comfortably. We’re so happy she’s okay. We’re also a lot poorer now, but we would do anything for our sweet dogs! Nikki has a follow up appointment next week, so we have decided to just stay in Jacksonville and let her recover. The first RV park that Deas had moved the RV too (Pecan Park RV Resort) was okay, but there was absolutely no shade, and the flight patterns from JAX ran right over the RV all day long. 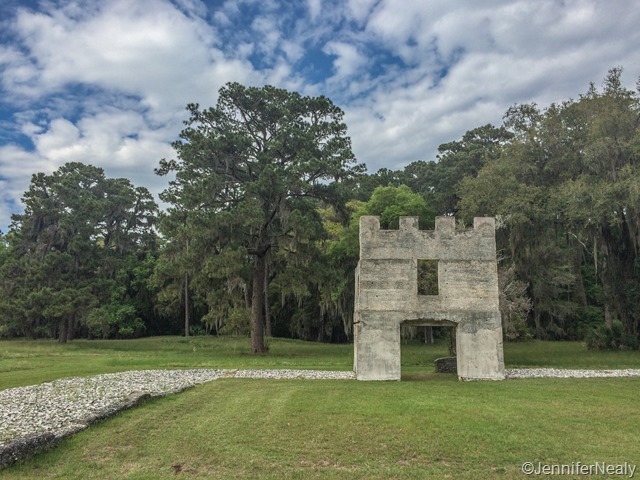 After a little research we found the Kathryn Abbey Hanna Park, run by the city of Jacksonville. The park is right on the ocean, but you would never know it based on the incredibly thick foliage – we feel like we’re in the jungle! The park has full hook-ups and thankfully had room for us to stay as long as we need to. 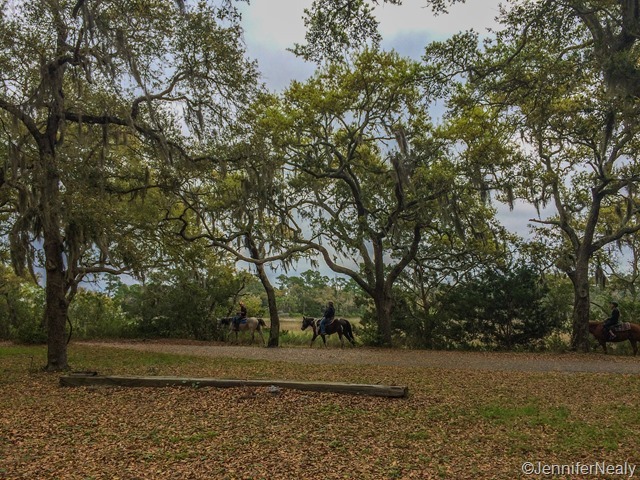 We had to cancel our planned stops in Beaufort and Charleston, which is disappointing, but all in all we are very happy with the way everything turned out. 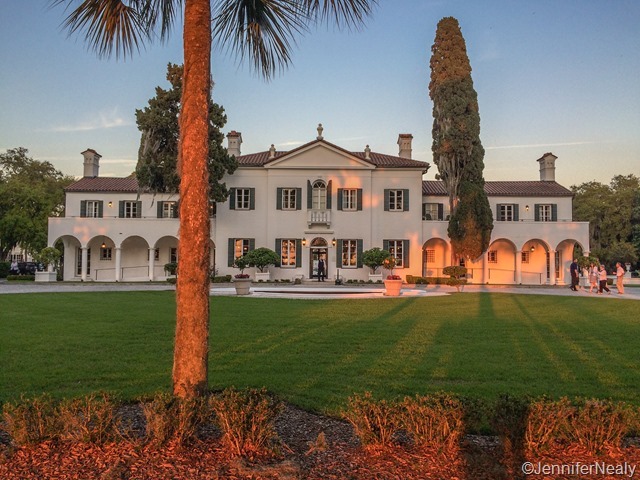 So we are back in Florida for now….hopefully our return to Georgia next week will have a lot less drama! So glad it looks like Nikki is going to be just fine. It’s awful when our fur kids are sick! We are so glad too! Poor Nikki has had her shares of trials and tribulations on the road. That story brought tears to my eyes. So glad she is back with you all and doing better. Believe me, I shed MANY a tear over this last week – the night before her surgery was the worst. She is a trooper. We are so glad too – I really was fearing the worse. Such a relief to see her sleeping at my feet right now! Yes, heart wrenching is a good way to describe it! We are so very grateful we got this figured out in time and that she had such a great care. It’s a hard thing to deal with when you’re on the road! Such a difficult ordeal you went through with Nikki. I followed her progress on FB and we were rooting for her the whole time. I’m soooo happy she’s better!! Thank goodness for the right vets,mat the right time. And of course the girl is a trooper! 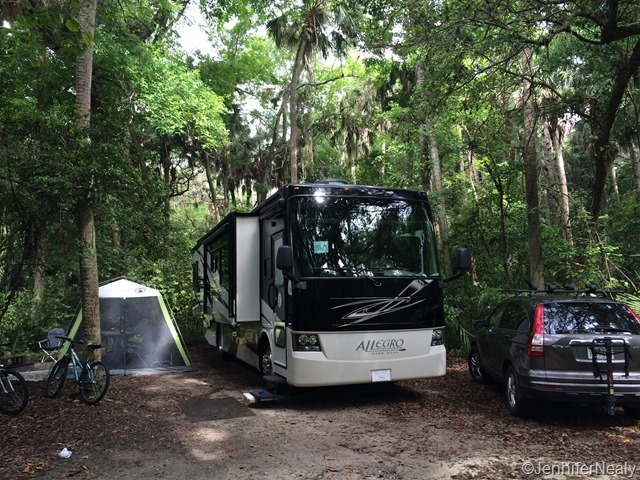 By the way, we also loved Jekyll Island Campground despite the tight sites. We had a very peaceful week stay there in 2010. Thanks for rooting for Nikki – I so appreciate your thoughts for her! It was quite a scare. 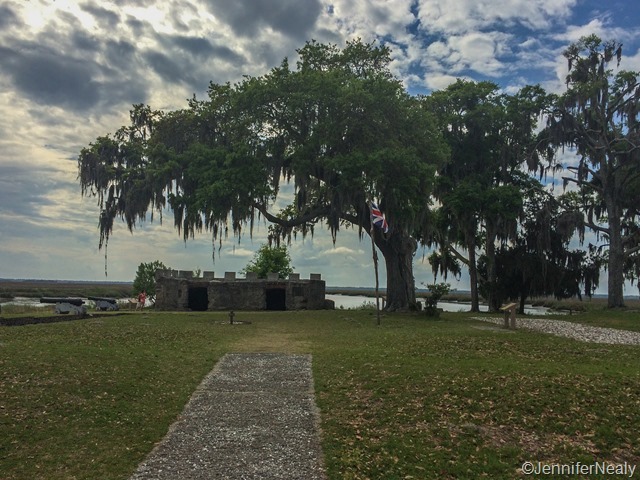 We really loved the campground and the island too – we’re definitely planning to return at some point. You can find their beer at many places in Georgia, not just on Jekyll. But it is more fun to try it on Jekyll! I’m not an IPA drinker, but they also have a Kolsch and a Blonde that I like. 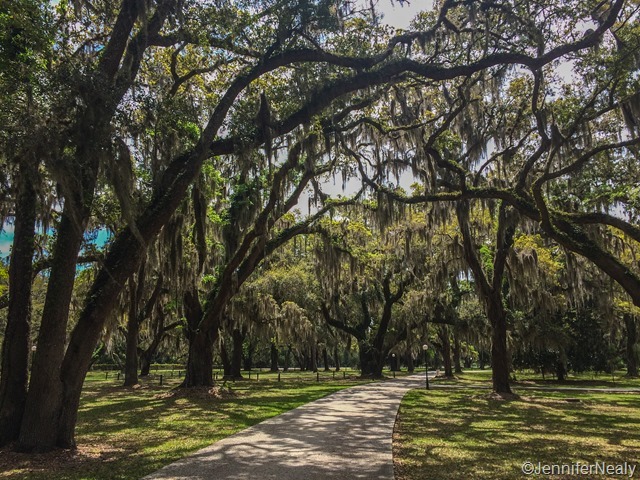 Yes, Hanna Park is great and we’re so glad we found it. It was a little busy over the weekend, but there is hardly anyone here right now and it’s great! We just added on another week so we’ll be here for awhile! So so glad your puppy is feeling better!!!! So scary!!! 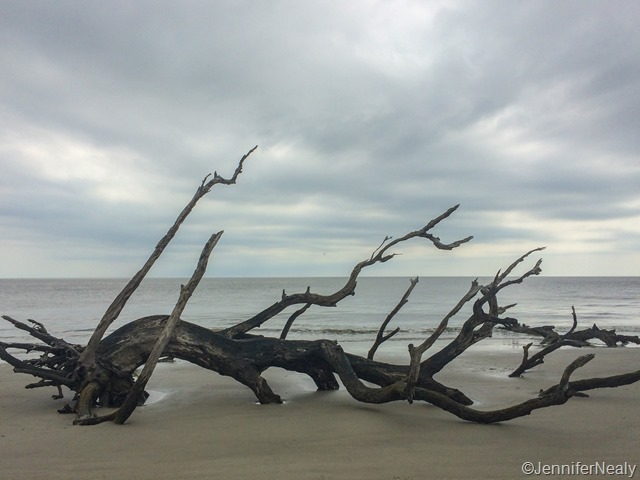 We went to Jekyll for Christmas and New Years and LOVED it – I didn’t want to come home ever. It was the quietest campground I have ever been to and the biking was amazing. Hoping to get back there next Winter! We are so glad she is better too! And that campground really is shockingly quiet – we are in a campground now that is not nearly as tight, but is much noisier. I wonder what it is about that place that makes everyone so quiet?! So very sorry to read about Nikki. Thankfully, you were near some great care and Nikki is on the mend. Having a sick pet is so difficult. It’s like having a sick baby that you can’t explain to them what is going on. So glad that Nikki is on the mend:) Please keep us posted on how she is doing. 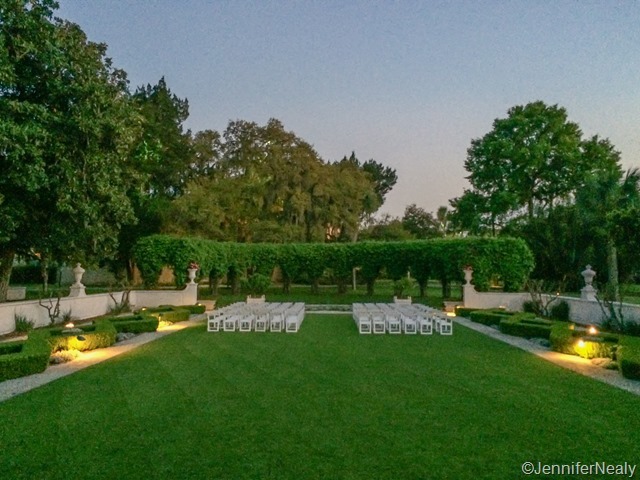 What a gorgeous spot for a wedding. The evening was beautiful. Yes, the silver lining is that we ended up with some amazing vet care, for which we are very grateful. And yes it was so hard leaving her at the vet each time because I know she couldn’t figure out why I kept leaving her! She is doing really well so far…still a little sore but eating well and she seems generally happy. 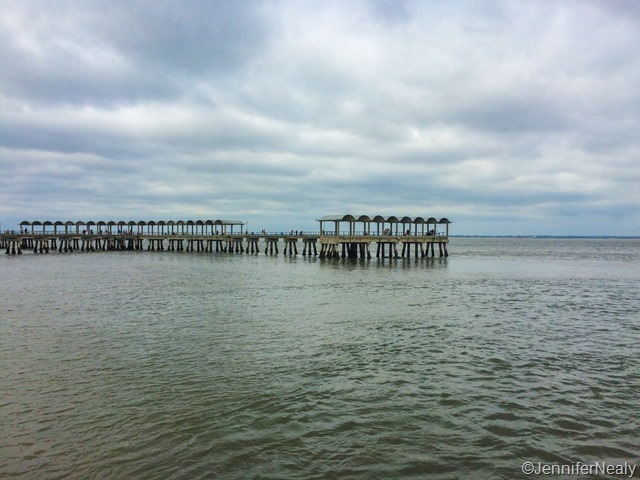 We will definitely plan a return to Jekyll, as well as Beautfort and Charleston. We may even do it this fall on our return from Maine! I’m so glad everything turned out so well, Nikki is such a sweet girl. I hope this means your vet quota has been filled for the year and the rest is easy sailing. 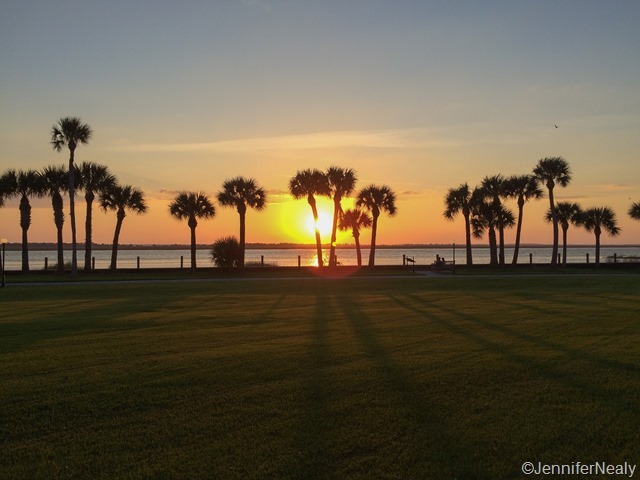 I am sorry you’ll miss Charleston, it’s a great town. Enjoy the rest of your stops! I wish someone would start a fund for people like you who can’t afford vet care sometimes or for a list of vets that would take and make allowable payments for our fur babies! It is a very scary to know no one and which vet to go to and trust! 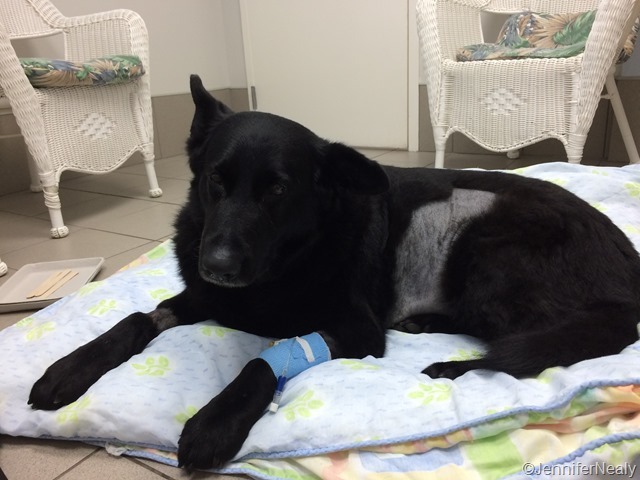 Nikki’s surgery was very expensive, but fortunately we are in a position where we could afford it. We considered ourselves fortunate in that we could tell the vet to save her no matter what the cost, but it did make me think about how much harder it would be if we weren’t in that situation. I think many vet offices have funds set aside to help people who are in a different situation, and in fact we talked about making a donation to such a fund ourselves. It was such a scary situation as is, and worrying about the financial aspect would only make it that much worse. But I’ll admit we never got around to doing that – so thanks for the reminder. I really should look further into doing this soon!